Three novelties will add further interest in the Federation Series on the Tuscany track. Roman De Beer will be racing with Victoria World, Maxime Jousse with BVM and Nicholas Latifi with JD Motorsport. 06/06/2012 - 12 challengers will be at the start of the first Italian race of a series that will be enlivened by a lot of novelties and that in the European series so far had 5 different winners in 6 races. The first two news involve the arrival of Roman De Beer on the Mygale lined up by Victoria World and that of Maxime Jousse on the number 3 Dallara of team BVM, with the latter being protagonist last year in the smaller series championship. Roman De Beer will be added to the lot coming straight from Formula ACI-CSAI Abarth as the South-African driver made his debut two years ago on the Tatuus of team Victoria and repeated the experience in three rounds held last year. 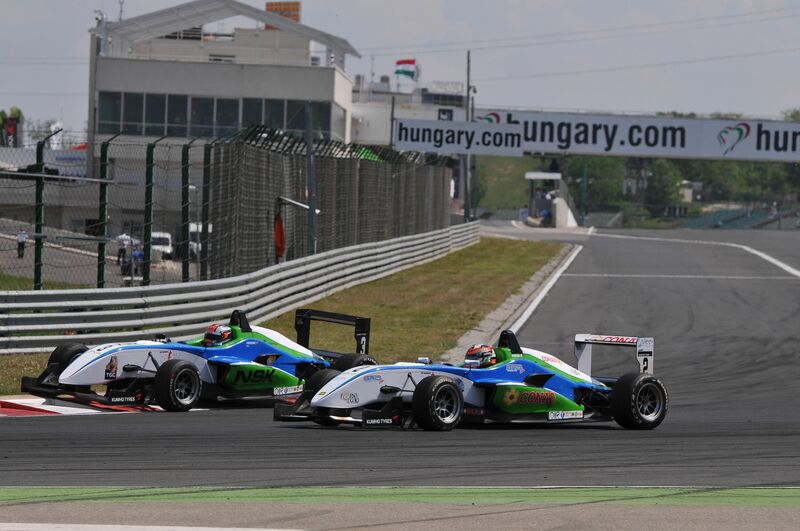 The Canadian Nicholas Latifi will change team instead and will take on track the second Mygale of JD Motorsport on the side of the Hungaroring ruler Riccardo Agostini. Three French cars will therefore fight for the Italian Championship and for the European Series. An eye will have to be kept on as usual on the three Prema Powerteam's drivers, starting from Eddie Cheever, as the fresh nineteen years old has set three pole positions in this season start. His team mates Henrique Martins and Brandon Maisano did good things in Valencia and Hungaroring and now the classification leader Cheever and Maisano in fourth are just 20 points apart. Another ace of the championship is certainly the Formula Abarth reigning champion, Sergey Sirotkin (Euronova), who has already obtained his first win in the European series as well as a second place in Valencia. Sirotkin, will not be involved in two championships in this occasion as happened in previous races when he competed in Formula 3 and in Auto GP. Team Ghinzani's drivers Gerard Barrabeig and Robert Visoiu will try and fight again for the top places despite their very young age. Maxime Jousse will be sided by Mario Marasca at BVM with the latter making big progress in a very difficult series like Formula 3. Marasca just missed on the podium twice in Hungary and he is finding the right parameters to stay close to the best race by race. The Mugello's weekend will start tomorrow with 4 hours of testing, while on Friday the only free practice session is scheduled for 10.20 (GMT+2) and will be followed at 17 by the two qualifying sessions. On Saturday - live coverage on Rai Sport2 and on webstreaming at www.acisportitalia.it and www.sportube.tv - the first race of the weekend will start at 15.10. Sunday morning, live on Rai Sport2 and streaming web, race two is scheduled for 10.10 while the sprint race run on 15' plus a lap will start at 18.50 (live coverage on streaming web and recorded on Rai Sport 2 at 00.00).